Avoid comfort and efficiency issues with swamp cooler service from Flue Steam. In any building, it is essential to maintain a balance in the air flowing in and out of different rooms in order to avoid creating negative pressure that interferes with comfort and energy efficiency. In most applications, balance can be achieved simply by installing air vents and return registers in every room. 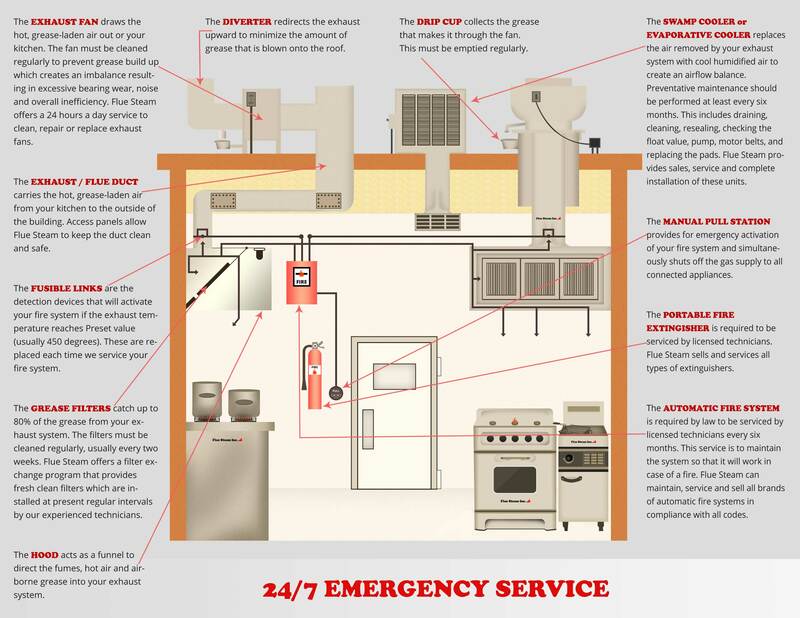 However, in the case of a commercial kitchen, this method does not work, because air that becomes hot and greasy from proximity to cooking surfaces cannot be safely or comfortably recirculated in the building. Instead, this air must be sucked into the kitchen exhaust system and vented from the building. For fresh, cool, new air, commercial kitchens must rely on makeup air handlers, typically in the form of a swamp cooler. Slamming Doors: When negative pressure is created within the building, this vacuum effect can actually cause doors to slam. Hot Dining Area: Another effect of negative pressure is more outside air getting drawn into the building, making it more difficult to keep spaces cool. Sweaty AC System: When the AC system begins working overtime to cool a hot space, this can result in humidity problems, increased condensation on the ducts, and potential water damage to ceilings. New Cooking Equipment Added: When your kitchen was first designed, the plans should have ensured a proper balance of air leaving and entering the kitchen. However, if you have added new cooking equipment since then the balance may have changed. One easy way to check is to add up the exhaust flow rates for all your exhaust hoods and compare that total to the output of your swamp cooler or other makeup air equipment. If the exhaust rate is higher than the output, you need more makeup air. As a first step to solving makeup air problems, your best bet is to check that your current system is actually producing the amount of cooled air it is supposed to. At Flue Steam, we offer expert swamp cooler service to help detect and correct air flow problems. Often, a small repair can restore your swamp cooler’s output to solve the air imbalance issue. However, in some cases you may need a replacement unit, a supplemental unit, or a larger unit to achieve proper air exchange. You can rely on us to tell you what you need honestly.